With scant details available about the phone itself, it has come as a bit of a surprise that eager sellers in China are already accepting pre-orders for Apple’s next-generation iPhone. 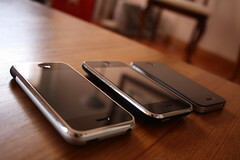 According to Reuters, such sellers have been taking advantage of Taobao to sell the iPhone 5. Taobao is said to be the country’s largest e-commerce system. Sellers on Taobao, a unit of Alibaba Group, are accepting orders of the iPhone 5, in some cases asking for a deposit of 1,000 yuan [approx. $160] for the new phone. One seller, “Dahai99888”, who started accepting pre-orders this week, is asking for full payment upfront, at a cool 6,999 yuan [approx. $1,100]. One thing the sellers could not pin down—and quite predictably, I might add—was an expected delivery time for the yet-to-be-released iPhone. As is characteristic of the company in the lead-up to the release of any new device, Apple has remained generally quiet on the matter, electing instead to allow its cult-like blogging community to stir up the hype. One particular rumor that has experienced considerable traction, though, involves the allegedly larger screen size of the forthcoming iPhone. If the “elongated” iPhone 5 cases being sold on Alibaba.com are indeed accurate as one seller “guaranteed” they were when speaking with Reuters, this rumor may be one worth entertaining. It wouldn’t be the first time the site got the inside scoop before the rest of us. Said to be a response to the “intensified competition” between Apple and Samsung, an upgrade to a 4.0-plus-inch screen from its current 3.5-inch model would be consistent with a proven move by consumers toward larger smartphone screens. However, with nary a source to confirm the rumor’s validity—save those reliable “people familiar with the matter”—it’s been uncertain as to whether that’s what we’ll see this fall.